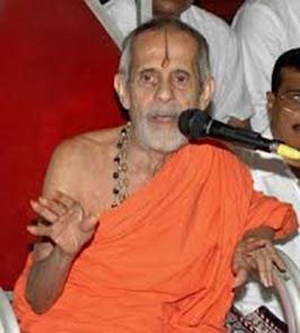 Udupi, Dec 27, 2014: Sri Vishwesha Theertha Swamiji of Pejawar Mutt has suggested the formation of committees to prevent forceful conversions. Speaking to reporters here, the Swamiji said the district level committees should have representatives from different religions and a representative from the government. It should visit places where conversions take place to ensure that there were no forcible conversions, he said. He further stated that he was of the view that it was only when conversions are conducted by members of Hindu religion that it creates a controversy while that was not the case when Hindus were converted to other religions. Both the cases must be treated on par, the seer argued. The seer at the same time made a conflicting statement that no attempt must be made to convert others. The Pejawar Swamiji welcomed the Union Government decision to confer Bharat Ratna on former PM Atal Behari Vajpayee and also posthumously award Bharat Ratna to Madan Mohan Malaviya. However he said he was not in favour of awarding Bharat Ratna posthumously.